Desh travels started its journey of transportation from November 18, 2012. It is a sister concern of famous industrial group Jamuna Industrial Agro Group Ltd. It is a partnership business of the group.It had only 23 buses when started the journey. All of the buses were Hino J1 Plus along with three Air condition Hyundai universe novels. Desh travels provides services in the divisional cities such as Dhaka, Chittagong, and Rajshahi with Porjoton city Cox's bazar. 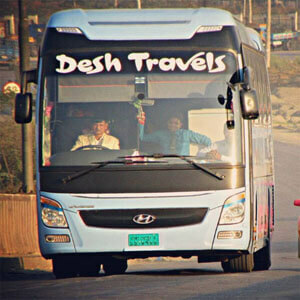 Desh travels serves the customers mainly in the northern Bangladesh. They serve in Dhaka, Rajshahi, Chittagong and cox's bazar. Desh travels have recently announced an amazing offer for its passengers. Now you will get special sanction for your used tickets. If you can submit 10 tickets that you have already used, you will get a new ticket in exchange for the old ones. But there are some conditions for this offer. The offer is valid from May 1 2017 until the next offer is announced. You have to submit 10 original tickets. No photocopy is acceptable. The ticket must contain the name, number and mobile number of the passenger. You will get 1 AC ticket in exchange for 10 used AC tickets. On the other hand, you will get 1 Non-AC ticket in exchange of 10 Non- AC ticket. The tickets you will submit must have the same fare or you won’t get the new ticket. Be remember that you can’t get an additional ticket if you buy ten tickets at a time. The offer is valid for only used tickets. But a discussion as on the table if the new ones can get or not. Desh travel gains goodwill in the transport business soon. You can call them for any query. The 24 hours call center is available to give superior service to the passenger. The helpline numbers are 01727370066, 01795096604, and 01795096605.